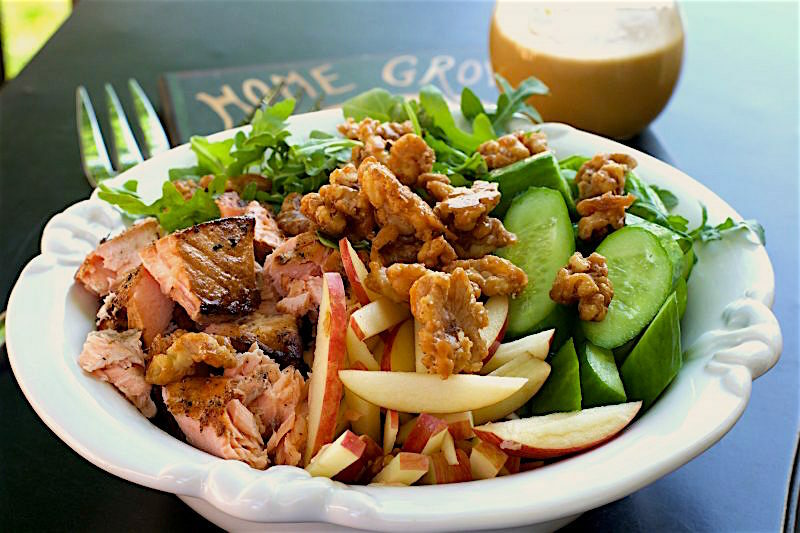 Applewood Smoked Salmon Salad - What the Forks for Dinner? This is a multi – faceted story……first off, Tim and I love salmon. Loaded with omega-3s , low in calories, and pairs with so many other ingredients the recipes possibilities are endless. In Tim’s line of work, he talks to lots of folks everyday. At one of his accounts called Breakers Saloon & Eatery, he has become friends with the owner Victor. Victor and his wife Jan have ran this popular saloon and eatery for many years. 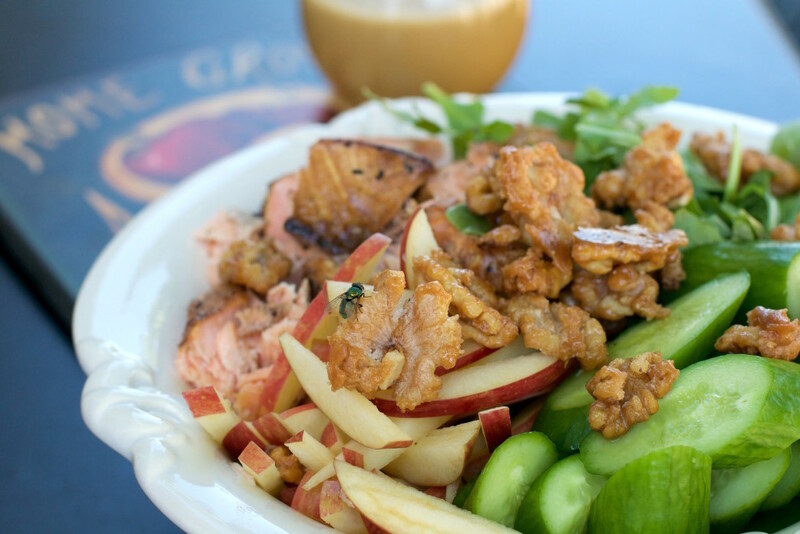 Tim and Victor always seem to come up with an idea for a recipe for me to try on their bi-weekly visits……Applewood Smoked Salmon Salad is one of them. Tim actually calls me after a ‘Victor visit’ and gives me the skinny…….salmon smoked with applewood…..I could work with that. It sounded really good. As I was mulling over what I could do with smoked salmon, I thought with applewood smoke……apples……I know brilliant right….lol. Next stop was my favorite place in the world…..well almost, the grocery store. I know its drudgery for some…….for me its bliss. Since I was making a salad, first stop produce. I like arugula. Its peppery, spicy and tangy taste and it’s light to dark green fleshy leaves resemble elongated oak leaves…making it flavor friends with lots of other ingredients …….like cucumbers……..I like the little baby cucumbers you can get these days… and fuji apples. My simple little salad needed a super yummy dressing……..another facet to the story. I can strike up a conversation anywhere, anytime, with anyone………way too many years in the foodservice industry. But I do enjoy talking to other folks and think nothing of butting into a conversation…….fault or asset…….??????? So, I’m at the store looking a vinegars for a dressing. There was a young woman and her daughter who were going through the store at about the same pace as me……you know how you are in a store and you keep running into the same person or people during your whole shopping experience…..it was like that. I hear the woman say to her daughter “Oh look apple balsamic vinegar. You want to try it with me?” The daughter didn’t respond …….but I did…….I said “I would love to try it with you” and picked up a bottle. We talked for a minute about my blog and she hopefully checked it out! So, to the lady who pointed out the apple balsamic vinegar to this food blogger , who was oblivious to it…….I say thank you and you have become part of one of my recipes!!!! Tim fired up the grill…..he is a grill-master now! I seasoned the salmon with salt and pepper. I didn’t want anything to distract from the flavor of the smoke. It was quick and easy to cook. I found a grill pan at the local dollar store that was like a cookie sheet with holes all over the bottom, perfect for smoking the salmon…..the last thing you want is for your fish to fall through the grill. If you do not have said pan, just use a piece of tin foil and poke a few hole through it….it will work the same. The rest of the ingredients…all three of them, were just a matter of slicing into chunks and julienne. You can cut your veggies however you wish, just make sure they are bite size pieces. 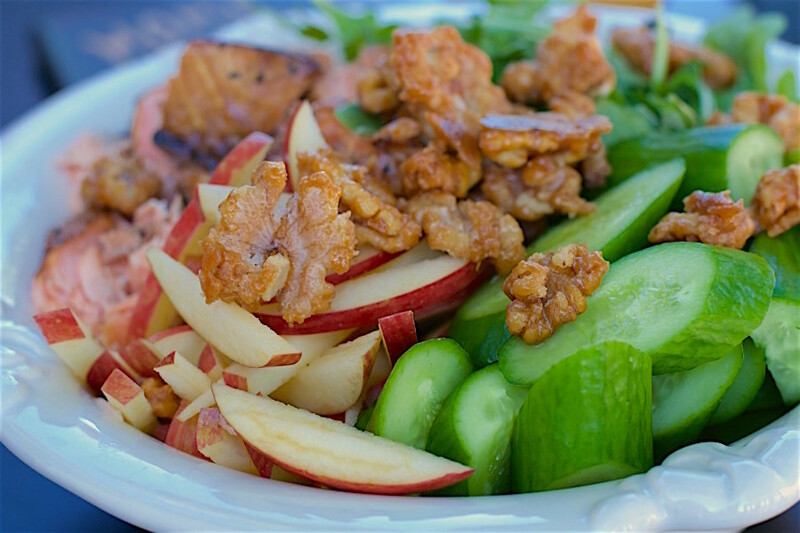 I did make something a little special for a garnish…..Candied walnuts…..soooo sweet and crunchy. Plus just quarter cup of walnuts,provides more than 100 percent of the daily recommended value of plant-based omega-3 fats(as if the salmon wasn’t enough), along with high amounts of copper, manganese, molybdenum, and biotin…….so good for you. I know, adding sugar takes a bit away from the health part, but……….they taste awesome on Applewood Smoked Salmon Salad. The dressing is a basic vinaigrette with the exception of the apple balsamic vinegar, and I added apple juice concentrate (the frozen kind), I really wanted the apple flavor to come through…..and it did. If you have one of those individual blenders…..like for smoothies…use it to whip up dressing, it emulsifies everything in a heartbeat. 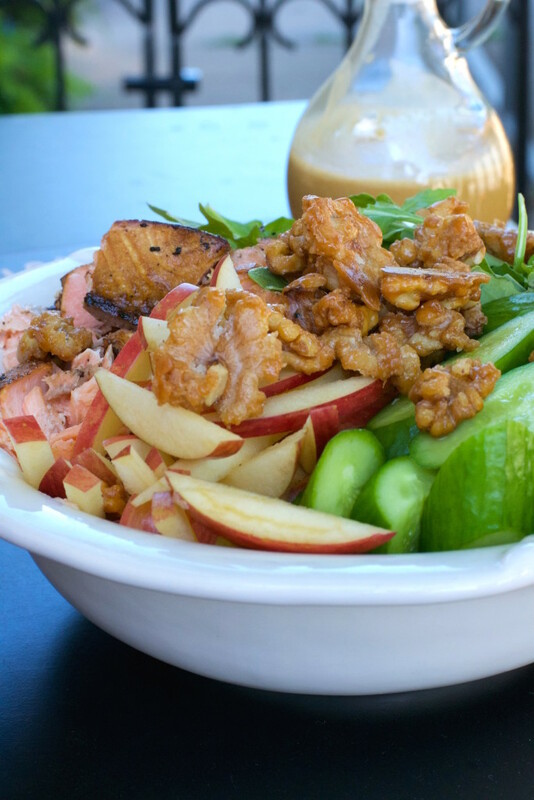 So, indulge yourself with a healthy pile of greens, cucumber, crisp, sweet flavored fuji apples, and applewood smoked salmon, topped with sweet crunchy candied walnut and a tart apple vinaigrette……Applewood Smoked Salmon Salad. 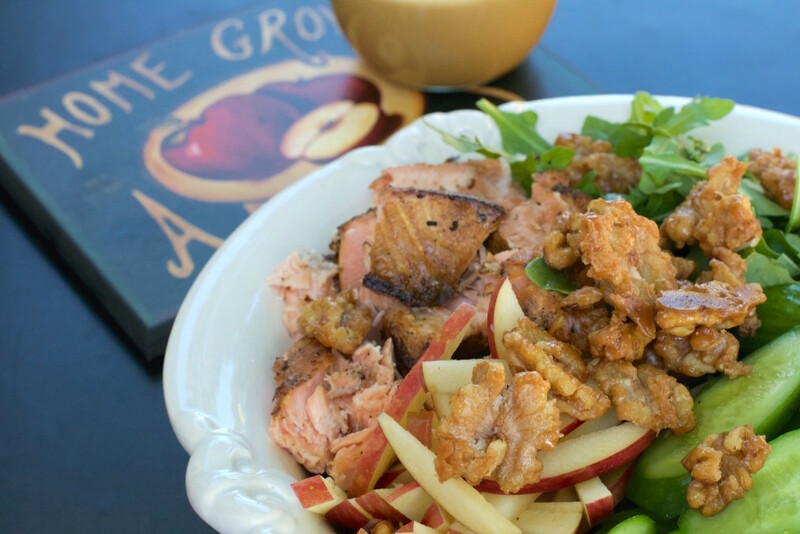 To smoke salmon: Soak about 2 cups of apple wood chips in water for at least 1 hour. Prepare grill (charcoal or gas grill) so heat is medium high. Place chips in a smoker box or directly on coals for a charcoal grill. 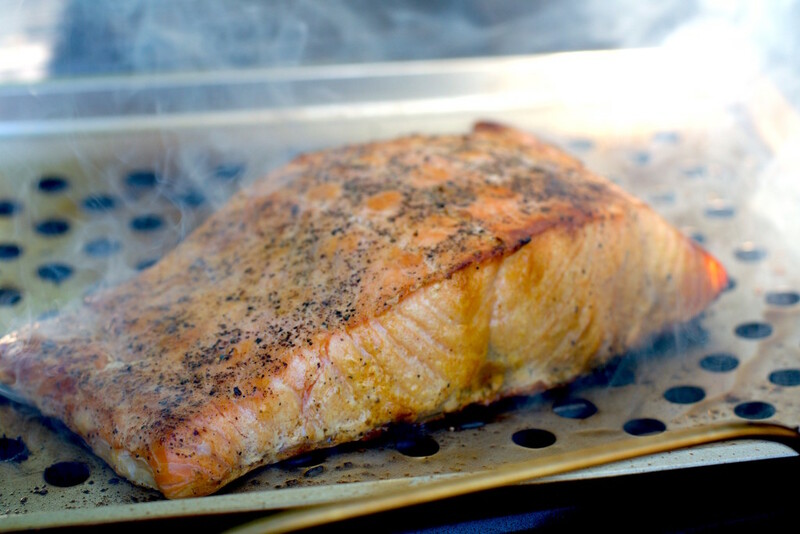 Place salmon on a grill pan with holes or on a piece of tin foil. Grill/smoke for 15-20 minutes or until salmon is cooked through. Remove from heat and allow to cool. Break cooked,cooled salmon into chunks. Arrange all ingredients in a bowl. 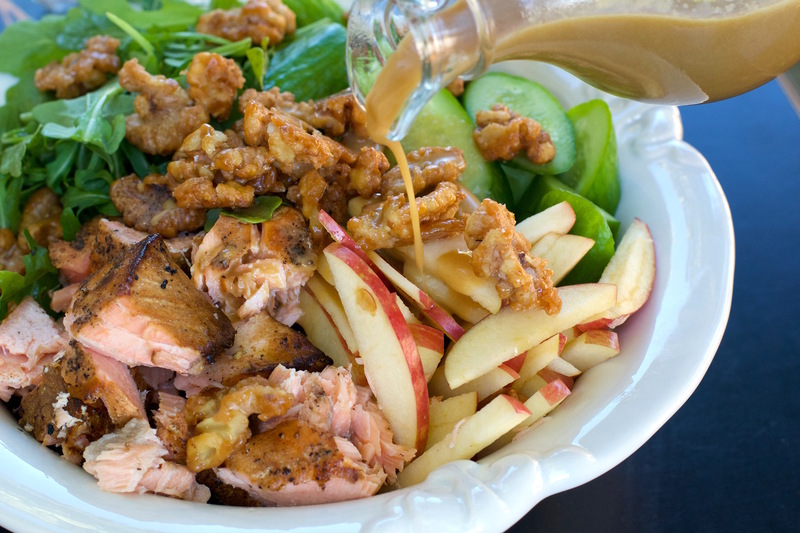 Combine all the dressing ingredients together. Whisk until emulsified. In a small non-stick skillet over medium heat, add 1 cup walnuts, ¼ cup granulated sugar and 1 tablespoon butter. Cook over medium heat for 5 minutes, stirring frequently. Once the the sugar starts melting, stir constantly until all sugar is melted and nuts are coated. Once the coating hardens (5-10 minutes), transfer to a bowl and enjoy!